Bryce Mountain Resort, Basye, VA is home to fantastic winter activities like Basye VA Skiing, Bryce Resort Snowboarding, and Basye VA Tubing. With dozens of great Basye VA Attractions in close proximity and Virginia Ski Slopes that are perfect for beginners, this Basye VA Resort is and ideal location for a family Ski Vacation Virginia. But what if you and your spouse or other grown-up acquaintances want a little time to yourselves during your Ski Vacation Virginia to Bryce Resort VA? This Basye VA Resort has put programs in place that make it possible for adults to enjoy alone time while their children are safe and occupied. SkiWee and Mini-Riders are two programs designed to teach children Basye VA Skiing and Basye VA Snowboarding on Bryce’s ideal beginner terrain. Bryce Resort VA’s young instructors are sure to have your children making the most of the Virginia Ski Slopes at Bryce Mountain Resort, Basye, VA in no time! SkiWee teaches children 4 and ½ to 12 how to VA Ski. 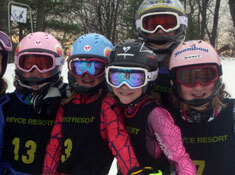 In this fun learning environment, your children can get their first introduction to Basye VA Skiing while gaining confidence and making new friends. Best of all, you’ll be able to enjoy yourself knowing that your children are in good hands and having tons of fun on Bryce’s VA Ski Areas. Mini-Riders is for six- to eight-year-olds who what to learn Bryce Resort Snowboarding. Mini-Riders takes place in the Little Nip and Mighty Might terrain area, which ideally situated so that parents can watch from Bryce Ski Lodge as their children cultivate their skills, or swing by while they themselves are Basye VA Skiing or Bryce Resort Snowboarding. Both of these options are great as they allow parents the freedom to enjoy some much-needed alone time and give children the chance to learn and socialize—both of which they are guaranteed to love! If your little ones are not yet ready for the Virginia Ski Slopes at Bryce Resort VA, the Basye VA Resort offers yet another option: The Bryce Kid’s Club. The Bryce Kid’s Club will free up your Saturday evenings at Bryce Mountain Resort, Basye VA, so that you can spend some time relaxing, night skiing, having a romantic meal for two at the Bryce View Lodge’s main dining room, or enjoying one of the many Basye VA Attractions the Basye VA Resort area has to offer. While you enjoy your freedom, you can breath easily knowing that your children are in good hands and having tons of fun. At the Bryce Kid’s Club at Bryce Resort VA, your children will participate in a variety of activities, like crafts and games, and will even be provided with a snack. Children ages four to eleven will love participating in these age-appropriate activities with their peers while their parents explore the Basye VA Resort area. With lots of Prince William County Snow, great Basye VA Attractions, and, of course, tons of Basye VA Skiing, Basye VA Tubing, and Snowboarding in Basye Virginia, Bryce Resort VA is a wonderful place for a family Ski Vacation Virginia. At SkiSoutheast.com, we can help you plan every detail of your Bryce Mountain Resort, Basye VA vacation. Looking for Bryce VA Rentals and Mountain Lodging Virginia Cabin Rentals? Our advertisers offer some unbeatable Virginia Ski Packages. Trying to figure out which Basye VA Attractions to make time for during your Ski Vacation Virginia to Bryce Resort VA? Consult our Trip Planner. We also have the latest Virginia Snow Conditions and the Weather Forecast Virginia so that you can make sure there will be enough Prince William County Snow on the ground that you will be able to get your fill of Basye VA Skiing, Basye VA Tubing, and even Basye VA Snowboarding! 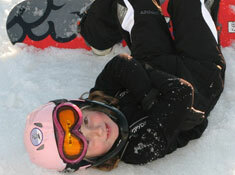 At SkiSoutheast.com, we have all the information you need to plan your next Ski Vacation Virginia. In addition to providing you with abundant information about Bryce Resort VA, we can also help you when it comes to planning your ski vacation to any of the ski resorts in the Southeast and Mid-Atlantic regions, including the very best Virginia Ski Mountains, all of the Ski Slopes in NC, the Ski Resorts in WV, the Gatlinburg TN Ski Area, Deep Creek Lake Wisp Ski Resort in Maryland, and even Cloudmont in Alabama. When it comes to planning fabulous trips to VA Ski Resorts like Bryce Mountain Resort, Basye, VA, SkiSoutheast.com is here to help you!